Super Savings! Up to 33% off on Uniforms, Work & Safety at Sherlock Coat. 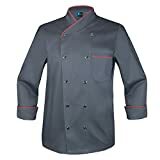 Top brands include Chef Works, Cherokee, European Military, Carhartt, Walls, SCOTTeVEST, Meta, 10oz apparel, Landau, WonderWink, Barco, Outback Trading, & Helly Hansen. Hurry! Limited time offers. Offers valid only while supplies last.